This week I have started a special bread intensive class at school. I know, I know, I graduated Culinary School last month. But there is still more to learn! I am not interested in taking the desserts and breads program (please, baking with endless eggs and butter? not my style) but I get so excited when my arms are elbow deep in dough. Luckily, two of my friends are also interested so we set up a special independent study with the bread Chef. We have dubbed ourselves the “Special Group.” Yesterday we did a lot of pre-ferments for the week and only baked the challah. (I didn’t get to take a picture until I already nibbled away most of the loaf!) Challah was relatively quick and easy to make. I’m amazed at how many eggs are in it. I wonder if there’s a way to duplicate the texture in a vegan style? 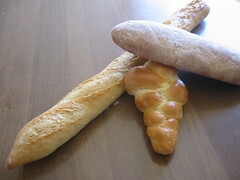 Poolish baguette, Challah, Ciabatta with Wheat Germ & Olive Oil. Today, Day 2 (of 8 ) was quite busy. While we had a leisurely lunch yesterday, today we filled our plates and the chef runs in and tells us we need to hurry and get the ciabatta in the oven. Otherwise it will over-ferment. Then we had about 10 minutes to eat before he ran back in to let us know the baguettes were ready. Five minutes later we had to run to get the ciabatta out of the oven. Ah, life as a baker. The bread has become our babies. I love it, though. Tending to it, making sure the yeast have a happy environment to do their thing; it is all very satisfying. Our ciabatta and baguettes today were made with a poolish starter that consisted of fresh yeast and equal parts by volume of winter wheat and filtered water. (Chlorine in tap water KILLS yeast). The baguette was relatively straightforward although I am not sure I can remember the individual techniques for kneading and shaping each dough. The ciabatta had wheat germ and olive oil in it. It’s not as greasy as some ciabatta I’ve had before, but it’s still delicious and rustic looking, with a great crumb. 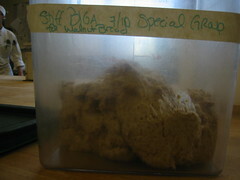 The stiff biga pre-ferment for tomorrow. 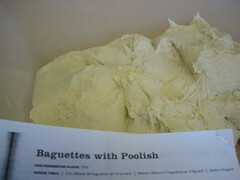 We set up two pre-ferments for tomorrow, finished all 6 turns for our puff pastry (hooray for sheeters! Yesterday we did one turn by hand and it must have taken at least 10 minutes. It’s less than one minute in the sheeter), finished 3 turns for the whole wheat croissants, and formed the brioche into balls (which is sticky tricky business). We brought the brioche out to form into their cute 2 oz fluted pans but it was too hot in the kitchen and the butter melted right out of it. That will be finished tomorrow. Brioche is really funny. It’s mostly butter so it’s hard to handle. But the funny thing is forming them into their pans. First, you take the ball and turn it into a bowling pin. Then you smoosh it into the pan like a flower. Finally you form the center ball which, when done correctly, should dangle like a punching bag when held upside down. There’s technique for you! I’ll be sure to take pictures of the brioche process tomorrow.